An associate of mine showed me a list of 100 slogans or taglines used by financial institutions along side their official name. Apparently, a great many companies are attempting to brand themselves as having a deeply embedded culture of listening. “WE LISTEN Business Solutions” is an international consulting firm. “The Listening Company” is the official name of an advertising agency in the United Kingdom as well as a non-affiliated nonprofit in the U.S.
A company simply called “Listen” promises to enable its clients to earn a place in the culture with innovative branding strategies. Usually, institutional branding slogans are the product of marketing consultants and not so much a reflection of widespread institutional culture. Reading through the entire list gives one the impression that the marketing objective is not merely to set the institution apart from their competitors but to position themselves as being different than the commonly held beliefs about the industry as a whole. I have come to realize that often THE DONOR’S STORY is just as important as your organizational story… Occasionally, it is FAR MORE IMPORTANT. 1) In order to build long lasting donor relationships, fundraisers need to develop the habit of LISTENING TO UNDERSTAND. We have to learn to talk with donors, not just talk at them. 2) In thousands of conversations with donors over the years, I have come to realize that often THE DONOR’S STORY is just as important as your organizational story. Many times, it’s more important. Occasionally, it is FAR MORE IMPORTANT. How different this is from the assumption that the organization’s story is the sole determining factor in a donor’s giving decision. I don’t know of anyone who has defined the art of listening better than the late Dr. Stephen R. Covey in his seminars and bestselling book, Seven Habits of Highly Effective People. You may already know about Covey’s fifth principle: SEEK FIRST TO UNDERSTAND, THEN TO BE UNDERSTOOD. However, it’s one of those listening skills that we all need to review periodically lest we slip back into the habit of listening to reply—that is, simply pretending to listen while looking for an opening to make points from our prepared presentation. There’s nothing wrong with prepared remarks (see last month’s article on The Preparation Habit). 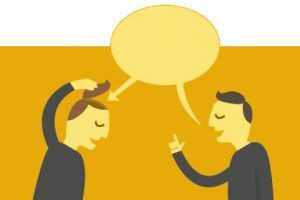 However, if we habitually listen selectively for the opportunity to play one of the conversation cards we’ve assembled in our hand, two things are likely to happen. 1) We miss some very important things we need to understand about those particular donors, and 2) donors get the impression that we really don’t care about them or what they have to say, only about what we have to say. Below are a few observations about seeking first to understand, then to be understood. In the hoopla leading up to Super Bowl XLVI, someone asked sports commentator Dan Patrick about how he became such an effective interviewer. He said that it had a lot to do with simply asking the right questions. He went on to explain that his goal was always to get their story, not the interviewer’s commentary. That approach was contrasted to a televised interview that same week. Tim Tebow, then the quarterback of the Denver Broncos, was on the set of a notable talk show host. Because the television was in an airport restaurant, the sound was turned off. All you could see were mouths moving, and almost all the mouthing was done by the host. Tebow smiled and laughed but seemed to say very little. Apparently, comments about Tebow’s play had been building up in the host’s mind for months, and the chance to unload with the subject on the set was just irresistible. The picture without sound dramatically illustrated the nature of that conversation. I wonder if all our donor visits were videoed and played back without sound or if we just looked at conversation transcripts, what would they reveal? Attorneys making the transition to charitable estate planning requires a significant adjustment. Leaning in to hear and understand the subtle implications of a donor’s story before getting into the transactional process can be difficult for those who are used to dispensing their expert legal opinions. I wonder if all our donor visits were videoed and played back without sound or if we just looked at conversation transcripts, what would they reveal? I had a ringside seat at one of the most profound examples of this I’ve ever seen. I told that story in a blog post a few years ago, so I’ll just give you the short version. It involved a $50 million estate and the transfer of the family business to the owner’s son, the couple’s only child. A full platoon of lawyers, accountants, and financial planners, along with their respective support staffs, had worked through all the details. However, when it came time to sign the papers, the owner would repeatedly freeze. It reminded me of the movie, “Runaway Bride”, starring Julia Roberts as a woman who fled from the church each time she walked down the aisle to be married. At one point in my friend’s ongoing negotiations, he invited me to attend the meeting of high-powered professionals simply as a spectator. In the second meeting I saw it happen again. He balked at the ownership transfer. The professionals were growing restless, but they were all billing hours so no one was too upset about the delays. During a break, I simply asked my friend how he was doing and if he really wanted to give the company to his son. He said that he truly did but began to tell me his story that none of the high-priced professionals waiting in the conference room had ever heard. Maybe he had told them, but they were too busy processing the transaction to hear what he had been saying [see FUNDRAISING AND THE ART OF LISTENING]. I’ve met with donors on numerous occasions in which their story was far more important than the story of the organization I represented. This was one of those occasions, and when I heard my friend’s story, everything suddenly made perfect sense. Truly listening with genuine interest is not easy or as common as you may think. Some just can’t bring themselves to do it. They’re too excited about their own story and their own agenda—far less interested in the agendas and stories of their donors. Those hindrances and habits are very natural. However, if we’re going to be “relationship professionals,” we need to step up to a higher level and practice Covey’s fifth habit of highly effective people—listening to understand, then to be understood. Eddie: really appreciate your perspectives on this topic. We at Gonser Gerber believe this skill is essential to effective donor work. Personally, I talk with our clients about the Art of Inquiry in order to make the point that informed listening on key topics important to the donor and the organization is central to inspiring him or her to move forward on philanthropic decisions. All the best to you and your family in 2018. Hope our paths cross again soon. Eddie – I appreciate your perspective on this topic. Too many times development officers focus on their metrics vs. the donor. Really listening to the donor and their goals and dreams will naturally sky rocket those metrics! Happy 2018!